The crowned-posthorn-type definitive Norwegian stamps of 1882 to 1929 may seem a bit intimidating, at first sight. However, each of the major groups shown on this page have specific design characteristics that enable the stamp collector to easily separate them. I have tried to illustrate all of the major denominations of each of the sets on this page. Mint condition images of these Norwegian stamps were impossible to find on the internet, and nice looking used condition images of all the stamps were extremely difficult to locate. I am not happy with the quality of some of the images, but at any rate, they are all provided below. 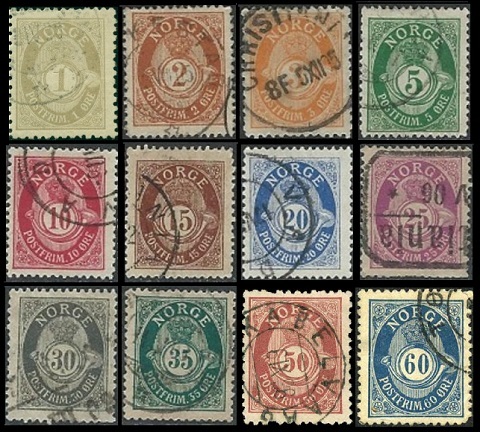 The eleven major-type crowned-posthorn definitive Norwegian stamps shown above were issued between 1882 and 1893. These stamps have the posthorn watermark, and they are perforated 14 1/2 x 13 1/2. 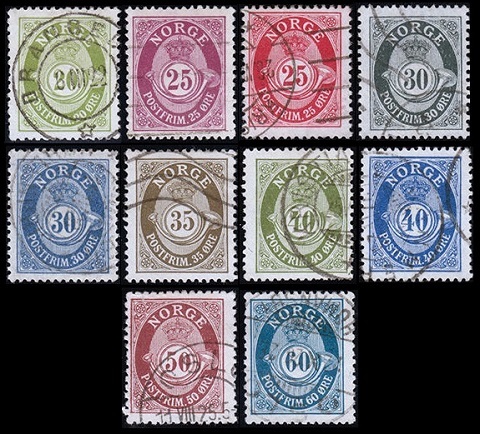 These stamps have the word "NORGE" in capital letters without serifs. The ring of the posthorn is not shaded, except at the top, where it is joined to the crown. 01 Ø. (1886 - Sc. #35) - Black Brown. 01 Ø. (1893 - Sc. #36) - Gray. 02 Ø. (1890 - Sc. #37) - Brown. 03 Ø. (1889 - Sc. #38) - Yellow. 03 Ø. (1883 - Sc. #38a) - Orange. 05 Ø. (1889 - Sc. #39) - Blue Green. 05 Ø. (1886 - Sc. #39a) - Gray Green. 05 Ø. (1888 - Sc. #39b) - Emerald. 10 Ø. (1882 - Sc. #40) - Rose. 10 Ø. (1886 - Sc. #40a) - Rose Red. 10 Ø. (1891 - Sc. #40b) - Carmine. 12 Ø. (1884 - Sc. #41) - Green. 12 Ø. (1884 - Sc. #42) - Orange Brown. 12 Ø. (1883 - Sc. #42a) - Bister Brown. 20 Ø. (1882 - Sc. #43) - Brown. 20 Ø. (1886 - Sc. #44) - Blue, Prussian Blue. 20 Ø. (1883 - Sc. #44a) - Ultramarine. 25 Ø. (1884 - Sc. #36) - Dull Violet. Numerous types of these Norwegian stamps exist, due to differing production methods. 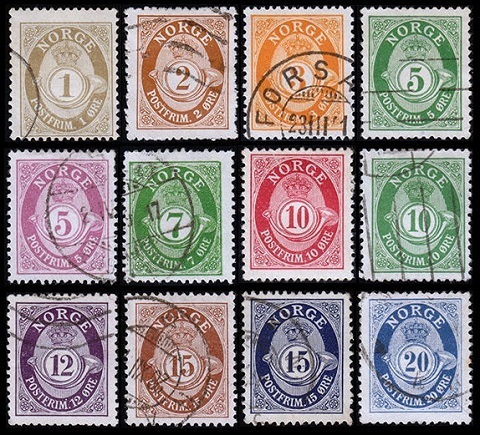 Rare varieties of the 03 Ø. and 05 Ø. denominations, that are perforated 13 1/2 x 12 1/2, were produced during 1893. 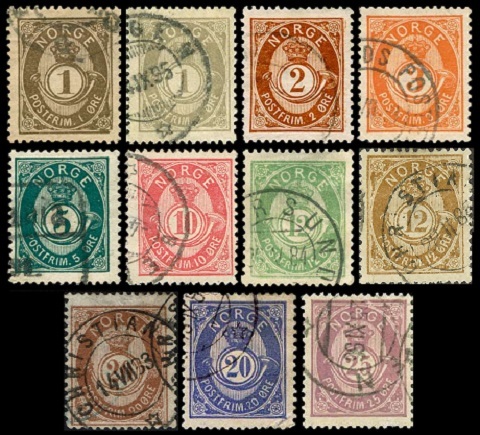 The twelve major-type crowned-posthorn definitive Norwegian stamps shown above were issued between 1893 and 1908. These stamps have the word "NORGE" in Roman letters with serifs. The ring of the posthorn is not shaded, except at the top, where it is joined to the crown. The 05 Ø. and 10 Ø. denominations were also issued in booklets. With these being the first definitive Norwegian booklet stamps, the panes are, of course, very expensive. 01 Ø. (1899 - Sc. #47) - Gray. 02 Ø. (1899 - Sc. #48) - Pale Brown. 03 Ø. (1893 - Sc. #49) - Orange Yellow. 05 Ø. (1898 - Sc. #50) - Deep Green. 10 Ø. (1898 - Sc. #51) - Carmine. 10 Ø. (1894 - Sc. #51) - Rose. 15 Ø. (1906 - Sc. #52) - Brown. 20 Ø. (1893 - Sc. #53) - Deep Ultramarine. 25 Ø. (1901 - Sc. #54) - Red Violet. 30 Ø. (1907 - Sc. #55) - Slate Gray. 35 Ø. (1898 - Sc. #56) - Dark Blue Green. 50 Ø. (1894 - Sc. #57) - Maroon. 60 Ø. (1900 - Sc. #58) - Dark Blue. The Scott catalog attributes, for stamps that are perforated 13 1/2 x 12 1/2, are as follows. 01 Ø. (1895 - Sc. #47a) - Gray. 03 Ø. (1895 - Sc. #49a) - Orange. 05 Ø. (1893 - Sc. #50a) - Green. 10 Ø. (1895 - Sc. #51c) - Rose. 10 Ø. (1896 - Sc. #51a) - Carmine. 20 Ø. (1895 - Sc. #53a) - Dull Ultramarine. 25 Ø. (1898 - Sc. #54a) - Red Violet. 35 Ø. (1895 - Sc. #56a) - Dark Blue Green. 50 Ø. (1897 - Sc. #57a) - Maroon. The four major-type high-denomination definitive Norwegian stamps shown above were issued between 1907 and 1918. These stamps are typographed and perforated 14 1/2 x 13 1/2. The common design features a portrait of King Haakon VII (Lived: 1872-1957, Reigned: 1905-1957). Die A - Background is composed of ruled lines. The ornament at the side has fine cross-lines and small dots. The design is 20 1/4 mm. high. Die B - Background is composed of ruled lines. The ornament at the side has large white dots and dashes. The design is 21 1/4 mm. high. Die C - Background is solid. The ornament at the side does not have ornamental marks. The design is 20 3/4 mm. high. 01.00 K. (1907 - Die A - Sc. #64) - Yellow Green. 01.50 K. (1907 - Die A - Sc. #65) - Ultramarine. 02.00 K. (1907 - Die A - Sc. #66) - Rose. 01.00 K. (1909 - Die B - Sc. #67) - Green. 01.50 K. (1910 - Die B - Sc. #68) - Ultramarine. 02.00 K. (1909 - Die B - Sc. #69) - Rose. 01.00 K. (1911 - Die C - Sc. #70) - Light Green, Dark Green. 01.50 K. (1911 - Die C - Sc. #71) - Ultramarine. 02.00 K. (1915 - Die C - Sc. #72) - Rose. 05.00 K. (1918 - Die C - Sc. #73) - Dark Violet. The twenty-two re-drawn crowned-posthorn definitive Norwegian stamps shown above were issued between 1910 and 1929. On the re-drawn stamps, the white ring of the posthorn is continuous, with no spot of color where it is joined to the crown. On the 03 Ø. and 30 Ø. denominations, the "3" is rounded at the top, instead of being flat at the top. The 05 Ø. (Green), 10 Ø. (Carmine Rose), 15 Ø. (Brown), and 20 Ø. (Ultramarine) denominations were also issued in booklets. 01 Ø. (1910 - Sc. #74) - Pale Olive. 02 Ø. (1910 - Sc. #75) - Pale Brown. 03 Ø. (1910 - Sc. #76) - Orange. 05 Ø. (1910 - Sc. #77) - Green. 05 Ø. (1922 - Sc. #78) - Magenta. 07 Ø. (1929 - Sc. #79) - Green. 10 Ø. (1910 - Sc. #80) - Carmine Rose. 10 Ø. (1922 - Sc. #81) - Green. 12 Ø. (1917 - Sc. #82) - Purple. 15 Ø. (1910 - Sc. #83) - Brown. 15 Ø. (1920 - Sc. #84) - Indigo. 20 Ø. (1910 - Sc. #85) - Deep Ultramarine. 20 Ø. (1921 - Sc. #86) - Olive Green. 25 Ø. (1910 - Sc. #87) - Red Lilac. 25 Ø. (1922 - Sc. #88) - Carmine Rose. 30 Ø. (1910 - Sc. #89) - Slate Gray. 30 Ø. (1937 - Sc. #90) - Light Blue. 35 Ø. (1920 - Sc. #91) - Dark Olive. 40 Ø. (1917 - Sc. #92) - Olive Green. 40 Ø. (1922 - Sc. #93) - Deep Ultramarine. 50 Ø. (1910 - Sc. #94) - Claret. 60 Ø. (1910 - Sc. #95) - Deep Blue. The overprinted and re-valued crowned-posthorn-type definitive stamp of 1883-1884 shown above (Sc. #46) was issued on July 1, 1888. This stamp comes in two shades, orange brown and bister brown. The three overprinted and re-valued Coat-of-Arms-type definitive stamps of 1867 shown above (Sc. #59-61) were issued on June 26, 1905. The two overprinted and re-valued crowned-posthorn-type definitive stamps of 1873 shown above (Sc. #62-63) were issued between 1906 and 1908. The overprinted and re-valued crowned-posthorn-type definitive stamp of 1910 shown above (Sc. #99) was issued on March 1, 1922.